When the places you frequent for walking the dog or a daily jog are of questionable safety, carrying a Sabre Red Jogger Pepper Spray with Hand Strap is the perfect solution. Sabre Red's extra hot 10% oleoresin capsicum formula measures 2,000,000 Scoville Heat Units, resulting in a 1.33% major capsaicinoids pepper heat that is 8% to 86% hotter than other brands on the market today and 6x hotter than chili peppers. This heat intensity is guaranteed by the High Preformance Liquid Chromatography (HPLC) Laboratory at Security Equipment Corporation. The Jogger features a convenient hand strap, allowing the spray to fit neatly into your palm. The pepper is delivered in a ballistic stream, and each canister provides 25 bursts that reach up to 10 feet, giving you ample time to take down a perpetrator from a safe distance. The spray formula also contains a UV dye for identification of a suspect after the fact. Sabre's pepper spray has a shelf life of 4 years. 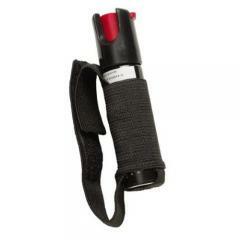 Great pepper spray which now comes in a pepper gel. Good size. Love this item, exactly what I wanted and delivered right on time.